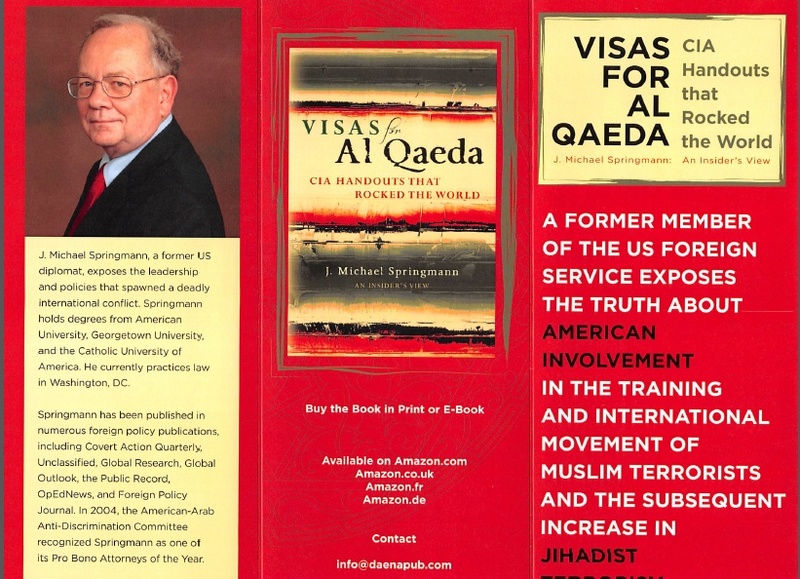 Mike Springmann, former head of the US visa section in Jeddah, Saudi Arabia, from 1987-1989. In Visas for al-Qaeda: CIA Handouts that Rocked the World, Springmann details how, "during the 1980s, the CIA recruited and trained Muslim operatives to fight the Soviet invasion of Afghanistan. Later, the CIA would move those operatives from Afghanistan to the Balkans, and then to Iraq, Libya, and Syria, traveling on illegal US visas. These US-backed and trained fighters would morph into an organization that is synonymous with jihadist terrorism: al-Qaeda." "I Know. I Was There. I Issued The Visas"
Springmann will share his first-hand experience of issuing US visas to would-be terrorists, a flagrant violation of US law. The plan is to distribute this handout to all the participants in the conference together with a lapel sticker that reads "Declassify the 28 Redacted Pages." Join author Christopher Bollyn as he discusses and signs his book Solving 9-11: The Deception That Changed the World. Washington, DC 20001 January 28 7-9 p.m.
An independent analysis of the events of September 11, 2001, that includes historical and geo-political background and examines the motivation of the people who played key roles in the destruction of the evidence and the obstruction of justice for the families of the victims. Recognizing the deception behind 9-11 and the "War on Terror" is the only way to free ourselves from fear and to extricate our deceived nation from the false logic of war that has been imposed upon us. Understanding who is behind the 9-11 deception is essential to grasping who is behind the fraudulent "War on Terror." Please help publicize the Bus Boys event with flyers (PDF). Books will be for sale in the Cullen Room on the day of the event. This can be a handout to help drive discussion, or a guide for yourself to help at dinner discussions.